I was not much of a Star Wars fan when I was younger. Even though the series began when I was a child, I didn’t see any of the movies until I was an adult and only watched the movies then because Kent wanted to see them. There’s an aspect of the Star Wars movies that seems very “B-movie” (low budget) or “cheesy” to me. The dialogue in the first one is laughable in my opinion. But I really like The Empire Strikes Back with Yoda as an integral character. After we watched the newest release at Christmas, we re-watched the first three movies that were released (episodes 4-6). I had a new appreciation for the depth of the story and the underlying themes when I watched The Empire Strikes Back. Kent has recited Yoda quotes for years, but I didn’t really make the analogy of Yoda as a Jedi Master being very similar to a psychic development teacher, until my latest viewing of the movie. Yes, indeed! I feel we were all born with intuitive insight. Unfortunately, for most of us, as we aged, we lost that natural claircognizant knowledge of who to trust, tendency to follow our own intuitive guidance, and ability to communicate with Spirit. To develop psychically, you definitely need to be more like a child. Unlearn the “adult” habit of ignoring your natural intuition. You can’t TRY to be a psychic medium. You have to BE a psychic medium (if that is your goal). You have to practice. You have to trust that you can do it, and then do it. So much in this small paragraph! Instead of “size” think in terms of “knowledge” or “acclaim”. Do not judge yourself or someone you retain (solely) on length and breadth of experience, fee for service, or popularity. I’ve retained people who have been doing this work professionally who were very inexpensive and amazingly talented, and I’ve also retained people who have a stellar resume and high fees, who were unable to provide me with basic information. There are A LOT of characteristics that go into choosing the right psychic medium. If you’re offering your services, don’t sell yourself short! If you’re seeking the right psychic medium, use “size” as just one benchmark, not the only one to consider. “…my ally is the Force.” Hell-oooo! 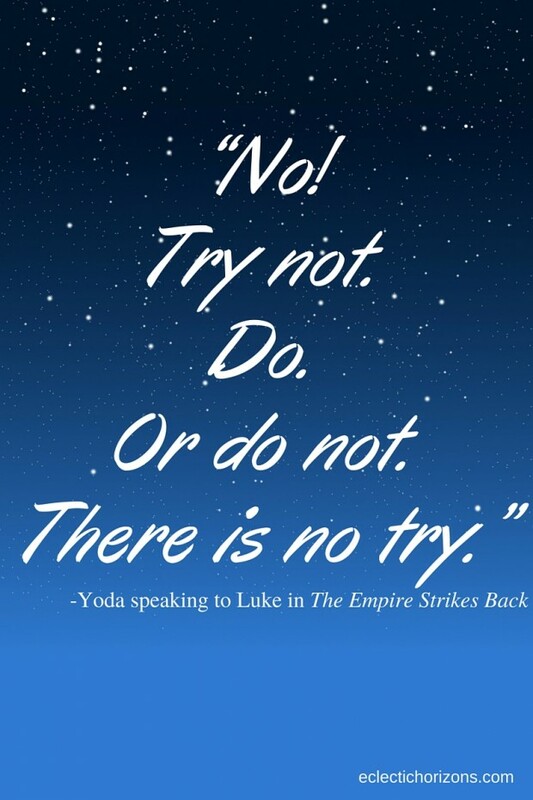 Yoda is referring to energy. Everything is energy—within, around, between. Energy. “Luminous beings are we.” Psychics, Intuitives, and Mediums are also known as “lightworkers” or “luminaires” who typically work with “beings of the light”. “Not this crude matter.” Have you heard the quote, “We are not human beings having a spiritual experience; we are spiritual beings having a human experience.” by Teilhard de Chardin? Same concept. This reminds me of another favorite quote of mine, “Argue for your limitations, and sure enough they’re yours.” by Richard Bach. Whether you believe you can communicate with your dead loved ones or you believe you can NOT communicate with your dead loved ones, you will receive what you believe. You cannot fully develop psychically until you believe you can develop psychically. The tag line for our companies is, “Expressing Creative Energy”. A dear friend of mine who died over a decade ago and now provides business guidance to us gave us that tag line. It works for all of our business entities. “Expressing Creative Energy” applies to Kent’s songwriting for our band Eclectic Verve, creating our albums and books through our publishing company Something on the Way Publishing, or when I communicate with your dead loved ones through Eclectic Horizons. Energy is how I communicate with your Grandmother. I feel her energy. By connecting with your energetic aura (the energy that is within you and surrounding you) I am able to feel your personality, your profession, or myriad other characteristics that comprise your energetic signature. We are all energy. The “Force” is in us and around us. “You will see other places” – This is called “remote viewing”. “You will see the future” – I see the future when I provide you with a prediction. “You will see the past” – I see the past when your loved one communicates a memory the two of you shared. “You will see old friends long gone.” – I see your dead loved ones. “Control. Control. You must learn control!” – Working with Spirit involves a lot of control. The creative mind is what Spirit uses to communicate through me and how I am able to read your energetic aura. My analytical mind is very helpful and is an amazing problem solver. However, to receive Spirit communication (mediumship) or psychic information, my analytical mind must step aside and allow my creative mind to take the lead. Because most of my life my analytical mind has been praised and nurtured more than my creative mind, my analytical mind was stronger when I first began to develop psychically. It took a great deal of control to allow my creative mind to be in charge. So whether George Lucas was particularly insightful or he received guidance from his higher self (with or without his awareness) or he just got lucky when he wrote this “story within a story” or it wasn’t George Lucas at all but instead this concept of “the Force” came from screenwriter Lawrence Kasdan, I don’t care. Although of course I want credit to be given where it is due, it is irrelevant to me who deserves attribution. What fascinates me is “the Force” explained in the Star Wars series aligns with my experience with energy and Spirit communication, and Yoda is not only a Jedi Master, but is a also a Master Psychic Development Teacher.